2D Card, DSP Board from Metric Halo. 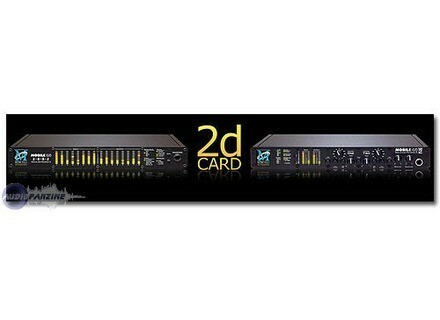 The 2d Card is an upgrade for Mobile I/O which is available for all currently shipping hardware models including: 2882, 2882+DSP, ULN-2 and ULN-2+DSP. Available as a factory-installed upgrade, the 2d Card enhances the DSP processing power of the Mobile I/O, adds a brand new ADAT implementation and also improves the clock of any unit into which it is installed. SugarBytes Updates Three Products Sugar Bytes has recently released three updates for their plugins. Effectrix 1.1.0, Artillery 2.0.4 and Unique 1.0.3. DSK Music DrumZ AkoustiK [Freeware] DSK MUSIC has announced the release of DSK DrumZ AkoustiK - a new acoustic drums module. Kong Audio ChineeSuona v1.5 Kong Audio has updated Chinee Guzheng to v1.5.